These gorgeous papers are from Rhonda at My Handbound Books and across the top are two handmade papers and two paste papers; across the bottom are two suminagashi and two ebru marbled papers. All made by Rhonda and my gift for winning her monthly newsletter draw. Thanks so much Rhonda. I'm torn between want to use them and squirreling them away in my marbled paper collection - that's the collection of other people's papers as opposed to my own marbled papers. My third welcome package in the mail was this book by Hilke Kurzke from Bonn. 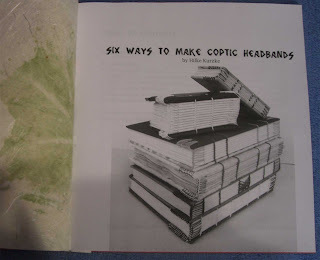 Hilke has been experimenting with Coptic headbands and has come up with this nice little book "Six Ways to Make Coptic Headbands", Buechertiger Press, 2009. As I enjoy making coptic bindings but I have serious doubts about the strength of the binding for such things as albums, I am always pleased to find information that may give that extra bit of support. This is another book I'll be working through in the next few months. You can purchase copies of this book, which I must add is very nicely and simply bound, from Hilke via her blog here. 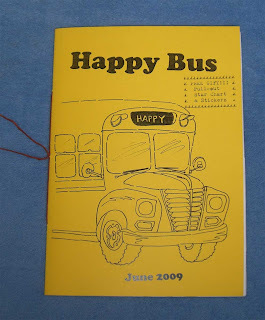 I mentioned before, but didn't have a photograph, that I also received a copy of Melior's "Happy Bus" zine, so here's the cover and it really is a happy read. I don't know when the next issue is due out but I'll be getting a copy. Meliors is producing some beautiful embroidery of sea fossils, along with her other skills book making and photography. Also into fossils and things scientific is Hope, whose blog can be found here and her Etsy shop longleggedfly here. I will very soon be wearing two of her fabulous silver trilobite pendants made into earrings. Hope is also a weaver and knitter. Everywhere I look there are such talented artisans, so many people combining a variety of arts and crafts. Most of us do it for love, a lucky few are able to earn a living from it. Luck is the wrong word there, it takes a huge amount of effort and talent and I guess the luck is in finding a market or being in the right place at the right time. Thanks for reading this long missive, do visit the people I've linked to and leave them a comment to say hello. I love your comments too of course. And after a lot of to-ing and fro-ing I've put my blog on Facebook and I'm still not sure if it's a good idea or not. Please tell me what you think. Nice little haul from the postie, Carol! I thought I might do some marbling today, but the wind has kicked in again so...probably ok for suminagashi, but absolutely no control on my deck! Hi Carol! thanks for sharing all those lovely papers ! Just beautiful... and for giving a the idea about the drawing. Think I might share some of my handmade papers that way. Looks like you struck it rich with the postal service this week! WooHoo! 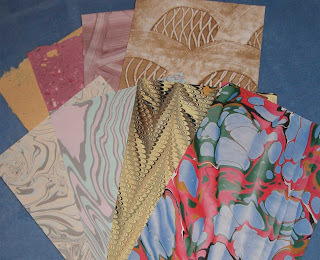 I love those marbled papers, and will have to check out your links to the other artists. 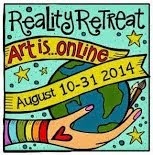 Thanks for linking Carol!! It looks like you might have a "Special" relationship with your parcel delivery contractor soon too. Mine sees me in another part of town, squeaks to a stop beside me and runs to my car with an armful of parcels!! Kind of hilarious, kind of embarrassing, very cute. Thanks for the notification! It’s always good to hear that a package arrived safely. And I am glad to hear that you like it! Looks like a great mail day - and thanks for your comment on my blog. Yay to parcels. My parcel guys don't recognize me yet, but I must try harder! What a great bunch of treasures! They just kept coming! I think it's great that you put your blog on facebook. Do you have a link for it? It will be a nice way for great posts like this one to get a broader audience! Lovely things! I flirted with this favourite, the blue and red 3D-Paper. But I have no use for it. Just admire. bravo Carol! So good to hear from you! hoping to see pics of your new grandbaby soon! 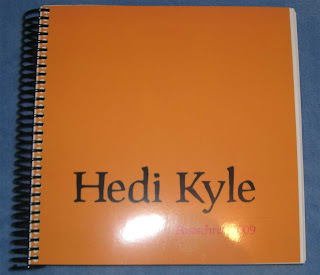 I just ordered the Hedi Kyle Festschrift...I can't wait for it to get here! I have had it on my wish list for a while, but reading your post pushed me over the edge...thanks!